When the battery voltage is above 4 volts, the Zener conducts( the Zener requires around 1 volt excess than its rated voltage for complete breakdown) and the base of the PNP transistor BC557 remains high and it will be in the off position. Since T1 is off, LED remains dark . When the voltage in the battery drops below 4 volts, Zener turns off and T1 turns on and LED lights. Connect the circuit to the emergency lamp battery observing the polarity. 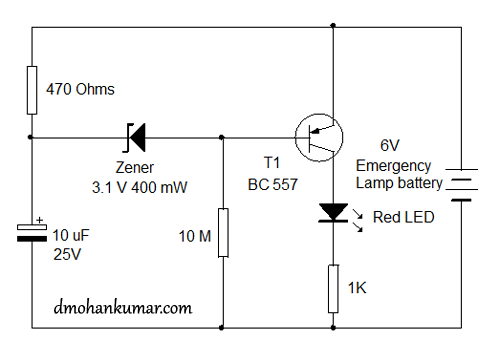 For 12 volt battery, change the value of Zener to 10 V.